Hello Monday! This is the day after my birthday and I am home, avoiding work (a day off) and enjoying some special time to play with my paper and inks. Today, I even think I am going to attempt to make a video! It's been a really long time since I have tried this, but I was thinking it might be fun to share a technique with ink and blender pens. For now, however, I want to share you with you a very special stamp set that you can earn for FREE, now through March 31st, 2016. All you would need to do is purchase $50 in any product from Stampin' Up, and you could select this, or many other super awesome products that are, well...FREE! Keep in mind, that if you were to purchase $100, you could select 2 Free items. Let's not forget that at $150, you would not only be able to choose 3 free items, but you would also qualify for hostess rewards. And, let's assume, you would instead like to give yourself 20% off all the time, it has never been a better time than to sign up with Stampin Up. For only $99, you can select $155 of any items you want. Then, after that, you can decide if you want to take it further and sell to your friends and family...or make new friends and sell to them. The rewards and benefits are pretty awesome. And it's very low pressure. You can do what you'd like to do from there. All the information is above in my links, or feel free to email me and I can share more information with you. 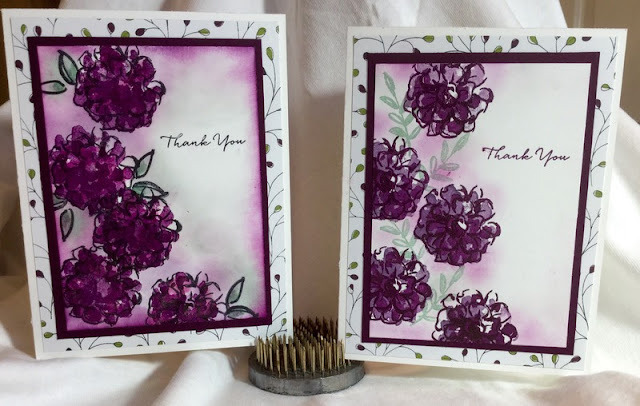 If you have enjoyed 2-step stamping, you are going to love this set. It even takes it a step further with 3 step stamping to add additional layers and depth to the image. Pretty, isn't it? Additionally, the designer series paper, Wildflower Fields, is also a FREE item with any $50 purchase. Remember, these deals are only now through March 31st...so now is the time to get these very exclusive and limited deals. These Cards are Gorgeous! Purple Is my Favorite Color. Looking forward to a Video. Was wondering If you have a channel on youtube?